Many of the centers are near or connected to Colorado’s ski areas and resorts, but there are also ranches, clubs and nonprofit organizations that maintain networks of trails each winter. The centers’ groomed routes, lessons, equipment rentals and warming huts with post-trek hot chocolate make exploring snowy landscapes a breeze. Below are a few snowshoeing and cross-country experiences you can have in Colorado. For more locations and information, check out the Colorado Cross Country Ski Association. First time snowshoeing? Read Beginner Snowshoeing Tips in Colorado. With natural snow and snow-making capabilities, it's easy to find freshly groomed snow at Breckenridge Nordic Center for cross-country skiing and snowshoeing. The center even has guided snowshoe adventures and Nordic ski lessons to help you get your snow legs before hitting the trails on your own. In the charming village of Crested Butte, more than 50 kilometers of trails meander through the outskirts of town and into the backcountry. Flats, rolling terrain and hills offer space for all skill levels. Those who want to make a full day of it can reserve a spot at the Magic Meadows Yurt for a gourmet backcountry dinner. Keystone's Nordic center offers rentals, lessons and guided tours in snowshoeing, skate skiing, cross-country skiing on their 16km of local trails and access to 27 more in the nearby White River National Forest. Afterward, hit the center's soup buffet to warm up and grab an apres-Nordic beverage. Right in the heart of Vail, hop on Vail Nordic Center's 17km of cross-country and skate skiing and 10km of showshoeing trails, with rentals, lessons and trails ranging from easy to difficult. The center even offers video analysis to improve technique. Homemade soups, snacks and beverage mean you can stay on the trails longer! With 80 kilometers of groomed trails, this is one of the largest free cross-country skiing and snowshoeing networks in North America. You can travel between the system’s hubs in Aspen and Snowmass, passing through wooded areas, hilly golf courses and peaceful valleys along the way. Frisco’s 45 kilometers of groomed trails along the shores of Lake Dillon in the White River National Forest are located near several major ski resorts, making it the ideal activity for those in your party who prefer not to hit the downhill slopes. The center offers snowshoe tours, where you’ll learn about the history and nature of the area. Spending several days at a guest ranch is the best way to truly immerse yourself in Colorado’s winter culture. The staff at the all-inclusive Vista Verde near Steamboat Springs takes care of all the details. Guests pop into the lodge for meals and rest, and spend the rest of their time traversing snowy trails, horseback- and sleigh-riding, dog sledding and more. Just steps from Eldora’s downhill ski area near Nederland, 40 kilometers of trails wind through quiet, shady forests and wide-open meadows. For those who’ve mastered their skis and snowshoes, the resort holds a series of night races in January and February, where adventurous folks don headlamps and vie for top honors. 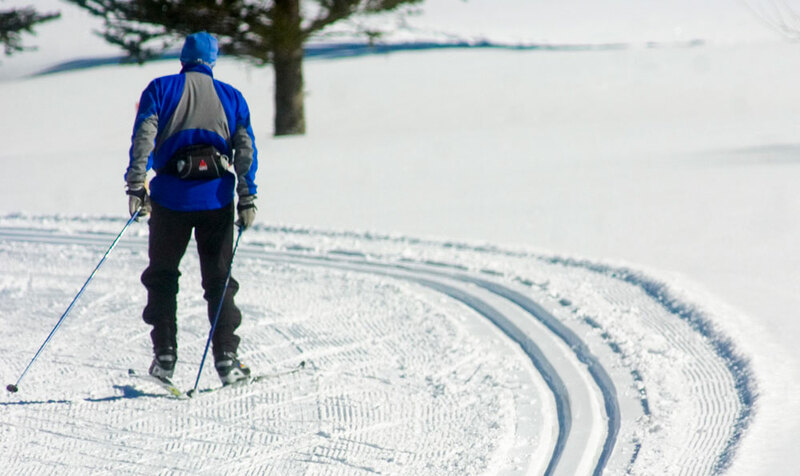 Check out our cross-country ski and Nordic center business listings and other trails for wintery fun.